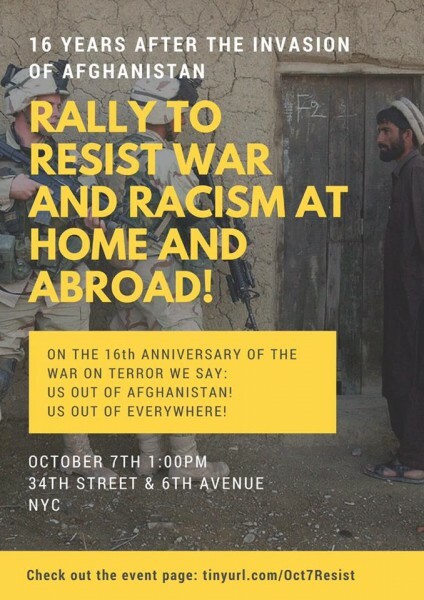 New Yorkers Resist Wars on Oct. 7 | Fight Back! New York, NY - Over 47 groups have signed on to the Oct. 7 day of action against U.S. imperialism. People will converge at on Saturday October 7, in New York City’s Herald Square, 34th Street, at 1 p.m. The day is important because it marks the 16th anniversary of the U.S. invasion of Afghanistan. Since then, the U.S. has continued a relentless campaign of war and genocide in every country it invades, from Iraq to Libya. The U.S. government claims it does this for humanitarian purposes, but the death toll says otherwise. The organizers of the rally have agreed upon simple, yet straightforward demands for the day. These include U.S. out of everywhere; stop the attacks on migrants, refugees and Muslims; No war, no sanctions; and the right to self-determination. 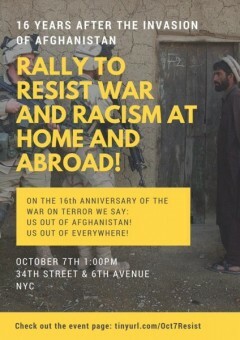 Organizers ask all to come out and join them in resisting war and racism, at home and abroad this Saturday. To find out more, go to the Facebook Event.